New Computar SWIR (Short Wave Infrared) type lenses from CBC America, Inc. are offered in 16mm, 25mm, 35mm, and 50mm focal lengths. These 2/3″ format (for up to 12.3mm image circle) fixed focal length models are megapixel quality – yet very economically priced for various types of hyperspectral imaging. These lenses are designed to operate in the 800-1700nm range, have locking screw feature for both focus and iris, and have M30.5 x P0.5 filter threads. 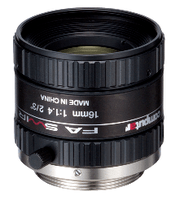 For information on additional Computar lenses.